At one point last week, at least half of my freezer was completely filled with cookies. No, but really. Even after I cleaned things out. Since then, I've mailed a few of them off, but there still remains well over 6 dozen cookies in there (probably closer to 7 or 8). We are going to have one tasty Christmas, that's for sure. See, I just don't believe in Christmas without a cookie plate. It's a necessity -- just part of how this holiday works. You walk by the cookie plate and grab a cookie. Christmas cookies don't come with any calories. Fact. Okay, or so I wish. I am not sure how I've made I through 27 Christmases and these have yet to grace the cookie plate. Kind of a crime when you think about it. Or taste them. Time to change that business. 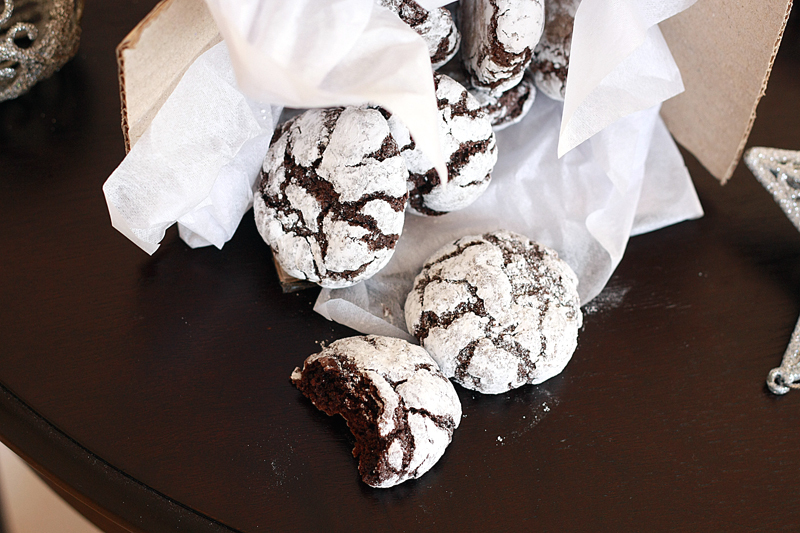 After making 2 batches of these, they are well on their way to becoming a holiday staple. In the large work bowl of a mixer, beat together the cocoas, granulated sugar, and vegetable oil until the cocoa powder is well hydrated. Beat in eggs, one at a time, fully mixing in before adding the next. Add vanilla. In a medium bowl, stir together the flour, baking powder, and salt. Slowly add in thirds to the wet ingredients. Once the flour mixture is fully incorporated into the batter, cover dough with plastic wrap and place in the fridge for a minimum of 4 hours. Preheat oven to 350 degrees F. Line baking sheets with parchment paper. Scoop dough into a tablespoon or a #50 size cookie scoop. Drop dough into the powdered sugar, roll until coated with sugar, then roll into 1-inch balls. Transfer dough ball to prepared baking sheets. Bake for 10-12 minutes, or until the dark, cracked part of the cookie looks baked. Let rest on baking sheet for 1-2 minutes, then transfer to wire cooling racks. I'll admit, I was a little leery when I saw these went for oil instead of butter -- until I remembered that's how brownie and cake mixes roll, soooo I should just go with it. And you know what? It works. 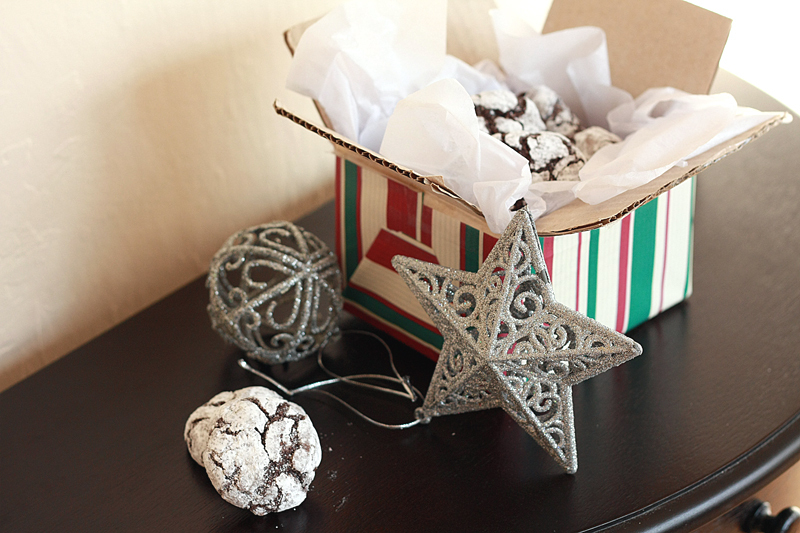 These are rich and fudgey -- pretty much just a brownie in cookie form covered in powdered sugar. Totally a cookie Adam can get behind. And me. Although I usually don't discriminate, I'll back most any cookie. My freezer is quickly getting stocked piled with cookies and it's driving the Hubs crazy! But I don't care :) I think I have alittle more room to fit these guys in there too! These look fabulous, and I always love the color contrast :) Great job! I love those cookies, perfect amount of sweetness! They have to be part of every cookie tray during Christmas. Every year I bake lots of cookies with my two boys. They give them as gifts to friends, neighbors and baseball sponsors. Thanks for sharing! These look seriously, seriously good! You know, this is one of my ABSOLUTE favorite cookies during the holidays! My mom makes these for the holidays and they look just like that. She is a baker and even named them after me because I love them so much haha. "Raven's Crinkles", so when people order that is what they order, hehe. They look awesome! Super yummy cookie, looks so moist and delectable. I am always wary of oil but you are right, that is how the top guns roll. Gonna have to remember that next time I go to raise an eyebrow over a recipe ingredient. Lol! 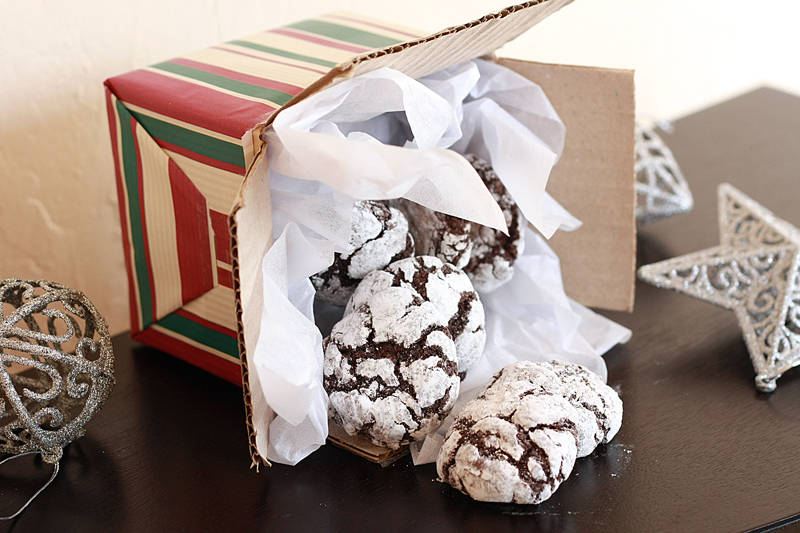 The other day my husband of 1 1/2 years told me that the one Christmas cookie he really enjoyed was chocolate crinkles. I had no idea what he was talking about. You saved the day! These look delicious! I put them on my list to make, but hadn't picked a recipe. It's great to know that you gave these an "A"! Love these! I've never made them, but I love the crinkled look! These are such a delicious cookie. I went to a cookie exchange and someone had made this exact recipe. They were so fudgy!